Dr. Donald Cadle provides restorations for dental implants at our New Port Richey, FL, dental practice. While he does not perform the implant surgery himself, the doctor can help patients determine if they make a good candidate for the procedure, and refer them to reputable, trustworthy oral surgeons in the area. 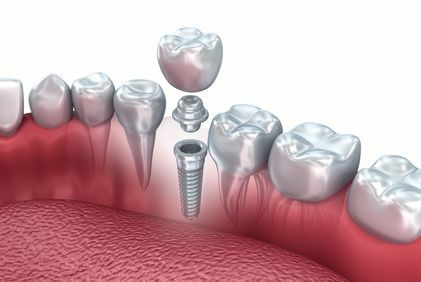 If you have lost teeth due to decay, gum disease, or trauma, dental implants will provide a sturdy anchor for restorations, such as crowns, bridges, and dentures. Dr. Cadle will help you determine which restoration will work best for you. "While he does not perform the implant surgery himself, the doctor can help patients determine if they make a good candidate for the procedure, and refer them to reputable, trustworthy oral surgeons in the area." When you arrive for your surgery, your oral surgeon will make you comfortable and begin administering anesthesia. Next, the doctor will surgically place the implants in your jawbone. For a single crown, the surgeon will place just one implant, while a full denture may require four to six implants per arch. You will receive a temporary restoration to wear while you heal. The implants typically take three to six months to heal, during which time the implant and bone will fuse together, creating a solid foundation for your new teeth. While your jaw heals,Dr. Cadle will forward his design for your restoration to a reputable U.S.-based dental lab for fabrication. When your implants have fully healed, you will return to our office one more time. Dr. Cadle will expose the implants from under your gums, and attach tiny connectors to them, called abutments. For patients receiving a dental crown or bridge, the doctor will use a dental adhesive to permanently bond the restoration in place. Dentures, on the other hand, can simply snap on and off of the implants, and patients can remove them for easy cleaning. The doctor will check the fit of your restoration, making any necessary adjustments, and will ensure proper occlusion. When the doctor feels satisfied with the placement and fit of the restoration, you can leave our office with a completely restored smile. If you would like to learn more about dental implants and whether they are suitable for you,contact our office to schedule a consultation with Dr. Cadle. He will carefully assess your smile to determine your candidacy.